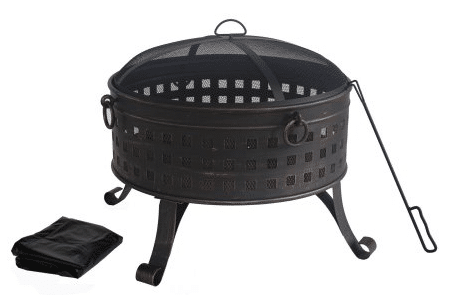 In this article we will look at Walmart's new for 2016 Antique 26″ Round Steel Fire Pit. I will give you the details and let you see if it is what will work for you. Getting a fire pit for your outdoor space will give you a conversation area and a place for family and friends to gather on the cool fall evenings. If you are looking for your first fire pit or replacing an older burnt out one, this one will give you many years of use, if stored properly. Now lets look at the details. This fire pit is new for 2016. Not many comments or information is available.I will give you my take on this item. The fire pit is 26 inches across and 24 inches tall with mesh cover on. The scrolled legs will support the weight of a large deep fire pit. The open lattice design will allow more viewing of the fire from the sides. 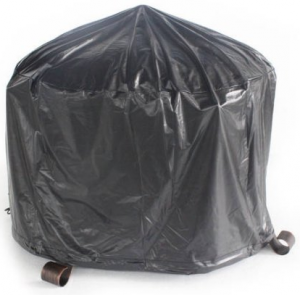 The fire pit comes with a mesh cover, cover lifting tool that can help keep fire wood in place, and a vinyl cover for storage when not in use. Has handles on the side to help in moving fire pit, just cannot move until cool or you use the proper protection from heat. Only minor assembly is required, just attach the legs and you are ready to burn. It is recommended to only burn wood without any excellarent to start or keep fire burning. You will need a large area that has a surface that will not burn or melt when it gets hot. It is recommended that you have at least 10 foot of area between your fire pit and any vinyl siding. If you want to use on a wooden or composite deck I have a article on the DeckProtect system that works for these surfaces. More than just a Fire Pit. Your friends and family will love to sit around the fire and talk about their day. You can cook hot dogs or S'mores or just share your favorite adult beverage. Making S'mores for your family should be easy, not very neat. First you will need a skewer, most will look like a two pronged fork on the business end. 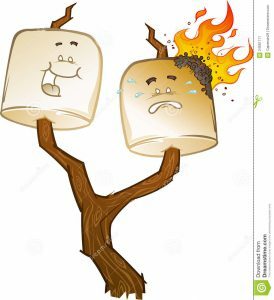 Put your marshmallows on the skewer and toast until brown or on fire. Just blow out the fire without getting burnt. Place chocolate on graham cracker and place hot marshmallow on chocolate and add top graham cracker. Allow enough time for hot marshmallow to melt chocolate. Try to eat without making a mess, good luck. Let me know what other items you like to cook on your fire pit. My fire pit is on its last season, this Antique 26″ Round Steel Fire Pit form Walmart.com is top on my list for a replacement. 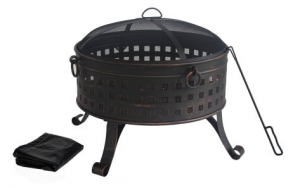 If you are in need of a fire pit for your outdoor space, take a close look at this example for the low price, the fact that it is easy to assemble and comes with a cover to extend its life. Thanks for reading my article, if you have any questions, comments or items that you need more information about, use the forms below. Don't forget to let your friends know and share with the social buttons below. This looks like a decent choice in my book. Easy to setup, and gets the job done. I can see it working for gatherings and small parties, but compared to other fire pits, it’s lacking. I hate that it can only burn wood. I like to throw in leaves and paper when I have a fire going. Thanks for the review. John, can you recommend any better fire pits? A less restrictive one? I will look and review a better Fire pit for you. The more expensive ones will be able to burn almost anything without damaging the fire bowl. I like the fact that this fire pit comes with storage and a cover! Storage space and coverings are a big factor for me when I buy something. This is especially the case, if it’s a one-time purchase that I’ll depend on quite a bit. I’m a sucker for fire pits too: they’re so inviting whether I’m with a group or by myself. I actually like the fact that this burns real wood too. That’s an added comfort to me. This is a great fire pit for the average person in their outdoor space. Most people will not use more than four or five times a year. I like to burn real wood in my fire pit for the great relaxing flame and aroma. Hi John, thanks for this article. I need a new fire pit because our current one was very cheap and it went all rusty because it was left out in the weather. I like the look of this fire pit you have presented. It is nice and deep, plus you get a cover for it, which is really handy. Thanks again! This is a nice fire pit for not a lot of money.